Funny how a snowmobile or ATV hitting an immovable object takes only a fraction of a second, but the sound of smashing alloy and plastic reverberates in my head for eternity. And it’s a sound that, try as I do, cannot be purged from my memory. I’ve suffered enough of these impacts to create a short, painful soundtrack of my inglorious moments as a snowmobiler. It begins with a charming little intro, from the time I was riding an Indy 400 between two railroad tracks that, unbeknownst to me, began to merge with a pole near the intersection. In a split second, I had punched the nose of the sled far enough into the pole to create a mild explosion of fiberglass, as well as wedging the sled between the rail tracks. I will never forget the sound, or the Herculean effort required to pull the sled backwards, out of its wedgie. Then there was the time I was on a Yamaha Phazer. Pretending to be Ricky-Racer-meets-Mr. Style, I was gracefully throttle-steering my way through a winding section of trail. I was so cool! In one fateful corner, with the back of the sled pitched mildly sideways, I looked back to admire the roost of snow. The reward for that bit of vanity was a sharp veer into the trees followed by more shards of plastic. And another piece of ear-piercing music. On another ride, I had the existential experience of watching my friend Steve attempt to pass me by taking a route off the trail and through the powder. He was riding an Arctic Cat Jag on loan to the magazine staff that I was a member of. 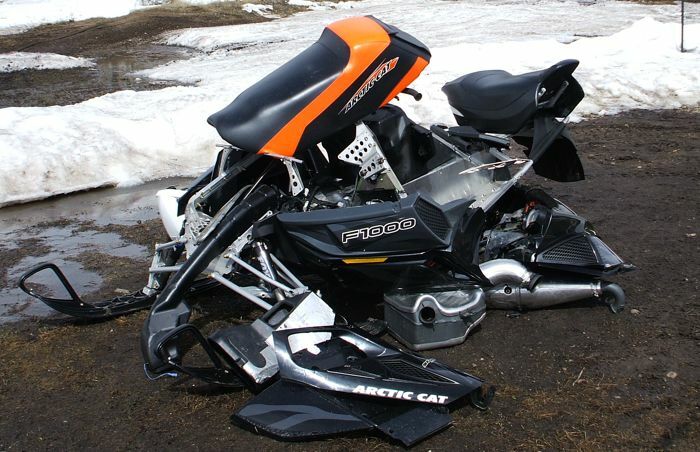 And when he unearthed the snow-covered tree that tore off the upper and lower A-arm of the sled (and wrecked the bulkhead), I heard both the horrible crunch AND what I anticipated would be a severe tongue lashing by my boss upon hearing the news. Add to these sounds the crescendo of several windshield-crushing rollovers and a few hateful bumper-compacting cartwheels, and something of a truly sad song plays as the soundtrack to my life as a snowmobiler, conjuring painful memories the same way an old love song reminds you of the hot babe who broke up with you in 8th grade. Strange as it sounds, for me these sounds are worse than the effort required fixing the broken stuff. I’ve long since forgotten about money I spent on parts, the hours of applying and sanding fiberglass, and the sore hands from drilling and riveting new bulkheads. But I can still hear the horrible crunch of carnage. 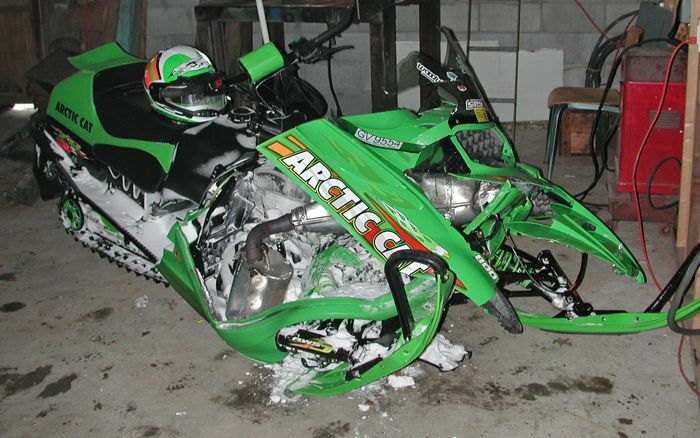 In this week’s Trailside Chatter, I ask if you’ve ever heard the sound of a snowmobile crashing? Do you know the crunch of splintering fiberglass or shattering plastic? What’s worse, the bark or the bite? Been there, done that. All I can say is OUCH!!! I remember a couple of events that made a lasting impression on me. I was on my home from the Scorpion factory in Crosby going through Brainerd and not on the trail. I elected to take the street as it was a shorter trip that way. Of course, I was also speeding. The next thing I knew a pickup pulled out in front of me and there was no stopping that Whip. It went under the pickup box and I laid out a perfect body formation in the side of the pickup box. Knocked out, punctured lung, broken arm, etc. Two days later I was out of the hospital and on my way home for Christmas. The Whip, not so good. Just one more. I used to think I was another Kirk Hibbert. While riding at night I decided to hit the road approach hard and fly it. I did a wonderful job of clearing the road. Problem is that there was a deer standing on the other side and my Prowler hit him square in the mid section. He came up over the hood and knocked me off the sled. I heard a great deal of laughter from my riding bodies as the deer was laying on top of me knocked out. I pushed him off of me, he woke up and just ran away. My Prowler hood, windshield, etc was gone. I barrell rolled a poor man's ZR (1997 ZL 440) running around 90 mph one time. It was my dad's sled of course. I got pitched off and somehow did a lawn dart into the powder and stayed standing up. Watched the sled roll multiple times down the field, somehow it only came out with a busted up windshield. I'm going to keep hitting refresh on my computer until I see what Stics9 posts to this. Most images I see of him are on a sled with bent parts on it, or the track in the air, or both. I remember hearing about the BL ZRT600 that engineering crashed. Story goes that Don Eide and another engineering were testing the BL against a production ZRT600 in the ditch in front of the Best Western. The engineer grabbed the brake, but there was nothing there. Apparently there was so many miles on the BL and the brakes were so worn that when he grabbed the brakes, the puck in the caliper fell out, or something to that liking. Needless to say, he bailed before the sled hit the road approach and nailed the stop sign on the other side. There was another story about an engineer that launched a Thundercat off the top of a gravel pile. Word is it landed about 12 feet off the bottom of the pile with a set of bend a-arms. Got a couple of good ones from when I was in watercraft, but I'll save those for another day. I have 2 crashes that are burned into my hard drive. I made it out with bumps and bruises on both and aside from not having the dazed and confused feeling I can remember each one like it was an hour ago. The most recent scared the daylights out of me, my riding buddies and wife. It's also the reason I wear a chest protector religiously and make sure my gopro is recording before I do dumb things. I was on an 800RR accelerating rapidly (thumb warmer element touching the grip) traveling at 50-60 when I connected with the section of large rollers I was aiming for. The next thing I knew I was airborne (still well with-in VFR), descending rapidly, banked right with a decreasing pitch attitude. My sensory cortex, cerebellum and motor cortex could not come to a conclusion of what to do quick enough. So I defaulted to clutching the handle bars until the ineffaceable crunch. The sled and I staying side by side for what seemed to be an eternity. As I violently rag-dolled across the snow, I remember seeing ground, sky, ground, sky, ground repetitively, wondering if the lights were going to go out. After 5 so complete revolutions, I had finally balled up enough gain control of my flailing limbs and came to a stop on my knees facing back the direction I came from. 60+ yards away from where lift off started. I wanted to stand up as quickly as I could to somehow show my friends I was alive and well. They made me sit down and make sure I was not seriously hurt, before tending to the sled that made out quite well with only a mangled set of handlebars, riser and stripped off windscreen. They straitened things out the as good as they could before we rode an additional 120 miles back to our start point. It was there we found out I had inadvertently switch the gopro into a 30 second burst instead of video recording. Team Mattison knows the sound....Thanks for the great write-up. Yes, three sounds at once! As an apple grower we sometimes use our sleds to get to tree pruning when the snow is deep. At the end of a March day I asked an older guy who had a sled on his farm if he would like to drive my ZR 600 about 2 miles back to the shop. I rode my wife's Z440 and the hired man followed behind. I got to the shop door and motioned for him to drive in. At this point all hell broke loose. He grabbed full throttle shot across the floor and blasted into the counter weight of a fork lift. The poor guy remained on the throttle thinking it was the brake until I hit the kill switch. To this day the stud marks are ground in the floor from the spinning track. I can still see the other employees jumping out of the way of the sled, the impact, and flying plastic. The driver all the time howled like Dr. Smith in "Lost in Space" (now I date myself), the other employees were hushed then broke out in hand covered laughter. I held my words until by myself but can laugh about now ten pus years later. Sorry Tom, I cannot divulge any information relating to the sounds of snowmobiles smashing. Currently I am working on my first book in which you will find in depth stories regarding my riding prowess. You have been elected to the board of review which will proof read this literary masterpiece. Thank you for your interest and keep in touch.